Discussion in 'The Pub' started by Nurk2, Apr 14, 2016. Fit/Style. Khakis need not be high-waisted, pleated, or baggy. Instead, opt for a more modern style: flat front, with a straight leg, or a little taper from thigh to ankle, and an all-around more fitted and tailored look. The pants should have a mid-rise fit that sits around your hips rather than up over your belly button. And while khakis are meant to be a little roomier than other pants, you don’t want them to be baggy. They should offer a look that’s both relaxed and athletic. stephax, 65DuoSonic, EricPeterson and 1 other person like this. If James Dean and Miles Davis can do it, you can too! 65DuoSonic, Jo-Jo Beans, EricPeterson and 3 others like this. I know what I'm wearing today! AZChilicat and Nurk2 like this. 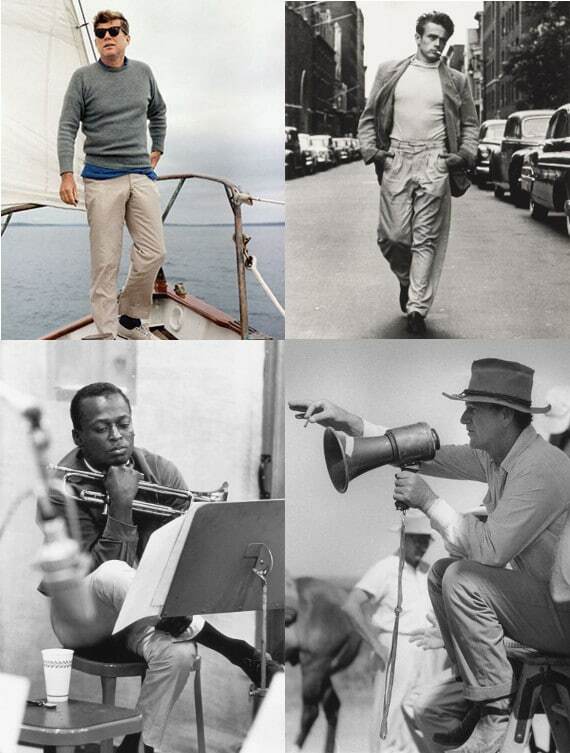 Steve McQueen - the king of cool. EricPeterson and sausagefingers like this. 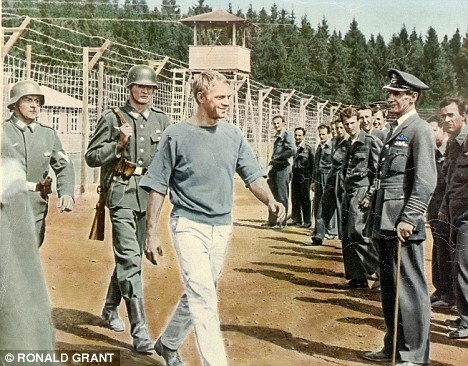 And when the Krauts march you off to the cooler, wear those khakis with pride! Rimbaud, Minte, Wrmbrnr and 4 others like this. James Dean, Miles Davis........and Jake from State Farm! Rimbaud, stephax, AZChilicat and 4 others like this. I've got black cord jeans on. I wear tan pants to the golf course all the time. 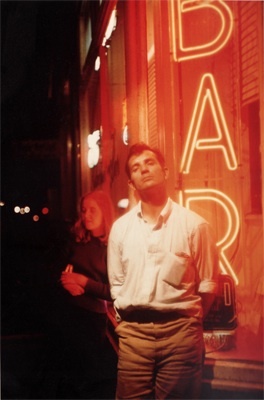 Kerouac, outside the Kettle of Fish in Greenwich Village. supergenius365 and AZChilicat like this. stephax, AZChilicat and 84Bravo like this. If you can't find a way to wear tan pants well, then you probably don't wear any of your clothes well. Rimbaud, CRBMoA, 65DuoSonic and 5 others like this. I'm wearing a pair right now with a purple polo shirt. Single pleat. I've had some of The Best Experiences In [My] Music Career while wearing tan pants. CRBMoA, sanrico, AZChilicat and 5 others like this. One Chord Wonder, sanrico, 65DuoSonic and 6 others like this. Tan pants are where it's at... But Zappa said "Brown shoes don't make it". I'd agree. This was my introduction to khakis. 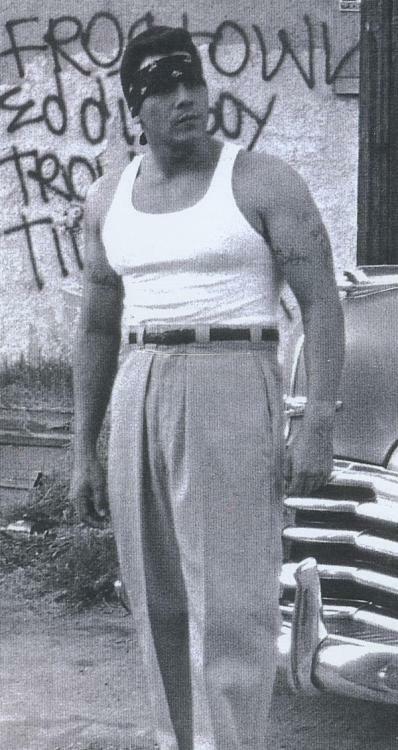 I grew up in East L.A. in the '50s and '60s as a minority anglo kid. Almost all the Mexicans wore khakis like those pictured above. They were so ubiquitous that "Khaki" or "Khak" became a derogatory term for Mexicans. 65DuoSonic, AZChilicat, Nurk2 and 2 others like this. This was my introduction to khakis. I grew up in East L.A. in the '50s and '60s as a minority anglo kid. What part? Every barrio has one white guy. Always. It's an axiom of the universe. Rimbaud, One Chord Wonder, sanrico and 4 others like this.